Objective: The purpose of the Shield of Faith. What does a shield do? Verse: Ephesians 2:8 (NIV) - For it is by grace you have been saved, through faith--and this not from yourselves, it is the gift of God. Shield - A shield can be moved to stop arrows coming toward you. Faith is believing God will do what He says; believing in something or someone that you cannot see. - Using the Shield of Faith worksheet, draw a shield on a piece of stiff cardboard. Cover the shield with aluminum foil. To hold the shield, poke two holes through the shield to thread a rope for a handle. (Give the child an apple.) What is inside the apple? (seeds, the white part of the apple, juice) I have a secret...there is really a star in the apple! (The child will probably doubt this statement.) How can we find out if there really is a star inside? (cut open the apple) Do you trust me that there is a star inside the apple? (Cut the apple from side to side through the seed part and show the child how the seeds in the apple and the area around the seeds looks like a star.) Just as you had to have faith that I was correct about the star, we need faith to believe that Jesus is real even though we can't see Him. Extends this activity by doing apple prints. Have the child write "I Have Faith" at the top of a piece of construction paper. Dab the apple several times onto a cloth to remove excess moisture. Place paint into a shallow tray. Have the child dip the apple into the paint and then place on the paper or on the Shield of Faith worksheet. 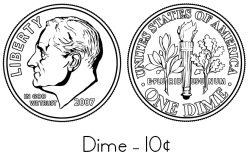 The dime is worth 10 cents (1/10th of a dollar). The dime has the profile of Franklin Delano Roosevelt, the 32nd President of the United States of America. The back of the dime has a picture of a torch (liberty) with an olive branch (peace) to the left and an oak branch to the right (strength and independence). "E PLURIBUS UNUM" means "Out of many, one." Examine the coin with a magnifying glass. What shape is this coin? What color is this coin? Who is on the front of this coin? What is on the back of the coin? Where is the value of the coin printed? Point to where it is printed. Is the edge of the coin smooth or ridged? - Coin Rub: Tack down two dimes - one heads up, one tails up. Place a piece of paper over the coins. Using a silver crayon, color over the coins to make an impression. - Color the Dime worksheet silver. - Gather ten dimes. Practice counting by 10's to 100 ($1.00). - Find a Coin: Hide a few pennies, nickels, and dimes in a tub of shredded paper or oatmeal. Have the child name the coin and say the correct rhyme for the coin found. This is a delicate issue that should not be used to scare but to educate children. Discuss that because of sin in our lives we all make bad choices. It is because of this sin that some people are not nice to children. Remember that most strangers are not dangerous. - A stranger is anyone that your family does not know well or someone that you have not been introduced to by your parent. Strangers can be any gender and look any way. Stay in safe places that are well lit and where other people are around. Stay where you can always see Mommy or Daddy's eyes. Never open the door to your home to someone that you do not know unless your parent is with you. Never tell someone over the phone that you are home alone. ...when an adult asks you to do something that your parents would not want you to do. ...when an adult asks you to keep a secret. ...when an adult makes you feel uncomfortable. ...when an adult asks you to go where other people can not see you or in a car with them. "No, Go, Yell, Tell" - Teach the child to scream "No!" at the stranger, run away, yell, and tell a trusted adult about what happened. It is always okay to tell an adult "no" if the child feels she is in a dangerous situation. Color the No, Go, Yell, Tell worksheet and practice each step. - Read Little Red Riding Hood as a fun introduction or closing to this unit. - A police officer's job is to keep people safe. - Review the fire evacuation plan and practice "calling" 911 in an emergency situation. Use the Dd Writing worksheet and for further learning check out the Letter D Activities. On 3/4" Tracing Paper take turns write the numbers 0 to 25. Afterward use an ink pad or a small amount of paint poured onto a surface for the child to add a fingerprint on every number except "0". Using last week's Book Summary worksheet format as an example, on a piece of paper draw pictures to represent the beginning, middle, and end of Doctor De Soto. - Be sure to "Picture Read" this book before reading. - This book is filled with so many points: kindness, trust, wisdom, husband and wife teamwork, vocabulary words, humor, size comparisons, and so much more. Each time that you read this book, focus on a different point. - Use this book to discuss stranger safety. 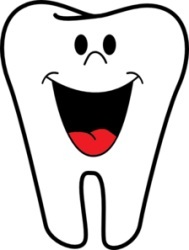 - Cut into puzzle pieces the Happy and Sad Teeth worksheet. Place the pieces in an envelope. Without telling the child what the picture is, give the child the envelope containing the puzzle pieces. Instruct the child to put together the surprise image. Once the child has put the puzzle together, glue the pieces together on a piece of construction paper. Color the tooth's "tongue." Make a shield of faith or use one from an Armor Set. Have the child stand holding the shield and throw rolled up socks or newspaper balls at the shield. Discuss how God gave us a shield to stop all fears and temptation that we are confronted with.